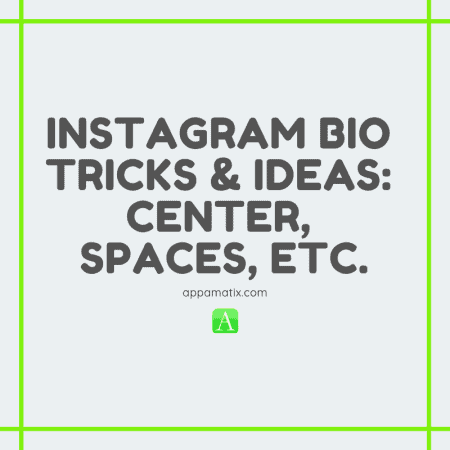 Instagram Bio Tricks & Ideas: Center, Spaces, Etc. Your average (active) internet user has a lot of social media choices available to him, and is likely using more than one of them at any given time. And each one has some sort of user profile set up, each asking for the same general information: name, email, username, profile picture… Now, if you maintain multiple social media presences at once, keeping all of these up to date can be tiring. Fortunately, most of these sites are designed in such a way that it doesn’t take much to make your page look nice. Unfortunately, while these default options take away a lot of the headache, using them exclusively tends to make your site looking generic and boring. I’ve created this guide that covers everything about bios and will leave you with the tools to create the absolute best Instagram bio any of your friends have seen. Remember that time you first saw someone match their Facebook profile photo with their cover photo? The tricks below will allow you to do similar customization and add a bit of creativity to your profile. The tips below will work no matter what device you’re on, iPhone, Android, Mac or PC. However, some devices have different emoticon keyboards so make sure you use a device that is compatible with the emoji you want to use. Every once in a while it’s good to update what your current understanding is of an app and see what new tricks have come about within the past several months. That’s why I’m providing the best 2015 Instagram tricks. These will help you impress your friends and get more hearts as people like your content more and more. It’s an easy way to step up your game and get more out of using this fun app. Many of the tips below will be applicable no matter what device you’re on, so if you’re using an iPhone, Android, Windows Phone, etc. You will be able to use these to your advantage. Some of the things below may require a bit of different steps to change the settings, etc. Where that is the case I will walk you through the different steps depending on your device of choice. Some of the tips below rely on you having access to a computer. Often times you can do things on a computer, email them to yourself and use them on a phone and you can get a lot more functionality out of them. This is a great option if you want to do some special text or really unique things that you’re limited by on a phone. While you can do a lot of the more common function from the various mobile apps, usually you need to be on the website to work with some of your more sensitive information (such as your settings and profile). Never mind the headache of trying to do fine formatting from a phone. So it’s helpful if you have a computer at hand. If you don’t, you’ll be able to do most things right on your phone but may want to save some for when you can get your hands on an actual PC or Mac. You can now edit your Instagram bio both on your phone and on your computer. These tricks work no matter if you’re on an iPhone, Android, PC, or Mac. This is also the same way that you can go about changing your profile photo if you also want to change that at the same time. Look for the little person icon at the bottom and tap on it. You’ll see an option to Edit your Profile, tap on it. You will now be able to edit your new name, username, you can change or add a website along with an bio. You will also have the option to change your privacy information. Finally, when you’re done you can tap Done on iPhone or Save on Android. If you’re on a computer and would rather change your profile on that, it’s super easy, just head over to this address: https://instagram.com/accounts/edit/# which will take you directly to your Instagram profile. Make sure you’re logged into your Instagram account, if you’re not already it will ask you to login using your username and password. Now that you’re up to speed on editing your bio, we can go into cool tricks that you can do with your bio. You may or may not have seen other Instagram bios that are completely centered and wonder how in the world did they do that? When you go to the app and choose to edit your bio, you can’t see any options to center and you’re stumped on how to actually do it. The funny thing about this trick is that it’s actually pretty simple and doesn’t require any special knowledge of the app, it’s just a clever way to work with what you have. Follow these steps to center your bio. First, you’ll want to head over to your bio page. From there, click to edit your bio. You may want to hit save and check your bio a few times to make sure it looks centered. That’s it, now your bio will maintain the extra spaces and stay centered. It didn’t take any special formatting, zero knowledge of HTML, and you didn’t even need to use anything more robust than the phone app. It’s just a series of spaces. This might sound obvious, but it isn’t really. A lot of websites with text entry have things configured so that duplicate spaces will be deleted, or at least won’t render. So you can space and space and space and space and it will never show up. That’s not the case here, and so this is something we can exploit. TIP: Centering looks better if you use short sentences that are stacked as opposed to a long sentence or a string of sentences. TIP 2: Want another way to center your bio? Simply open up Microsoft Word or any other text editing software and from there you can write your bio and center it. After centering your bio, just copy and paste it from the text editing software over to your bio and it will maintain all the formatting. You may not be wild about centering your bio but you just want to add some spaces to spread out the bio a bit and make it easier to read or flow a bit better. The trick with this is you can’t just add spaces when editing the bio and expect it to work normally, this is because Instagram has put in parameters to remove all unnecessary spaces to conserve space and make things simpler. However, sometimes it’s better to include those spaces to make the page more readable and appealing to the eye. To do this you will need to copy and paste spaces from somewhere else in order for Instagram to honor where you’ve included spaces (this is why the trick above works!). Basically, if you copy and paste the space from a different source, it acts as a character that can’t be seen. As in, there is a character there but Instagram just doesn’t recognize it so it shows the character as a blank. Pretty neat, right? To do this, just copy the following blank spaces and insert them wherever you want in your bio to maintain a space. Of course, you don’t need to do this with normal spaces between words as Instagram recognizes these. Use as much or as little of the spaces below that you want, just make sure you don’t copy and paste the arrows. If you don’t want to use as many of the spaces that are below, just copy a portion or copy it all then delete them once they are over on your Instagram bio. If you’ve seen businesses that use Instagram you may have noticed a lot of them use their website address on their Instagram posts and wondered how in the world they did that. Typically the app won’t allow you to include links within your photo descriptions as they want to keep it more personal and less business related. However, there is a cool way around this and best of all it’s super simple to do. All you have to do is when you take a photo on Instagram you will be asked to include a description and a location. Just enter in the website address in the box that asks for location. This will show up as a link on Instagram and you will be able to publicize your business or personal website on your posts. Another really cool trick is to use your Instagram post to point out a recent article that you’ve written and want your followers to visit. Simply include within your post text to visit your profile bio to find more information or to check out your latest post. You can also include your IG username to make it easier for them to visit your bio. Just put an @ symbol before your Instagram username and from there they can click it and visit your bio. Another awesome way to spice up your bio is to include various symbols, emoji, or emoticons to your description. Some people are split on this topic. A lot of people feel it does give a bit of color to a site (if used judiciously). Others are worried that it’ll hearken back too much to the old days of the internet, when every high school student had an Angelfire page needlessly festooned with blinking, spinning gifs, assaulting your ears with poorly rendered MIDIs. Just don’t go that far, and you’ll be fine. There are a bunch of different ways to add symbols to your bio depending on which device you’re using, what apps you have on your device, etc. If you’re using an iPhone make sure you turn on your global emoji keyboard that is built into every iPhone. Simply head over to settings then keyboard and scroll down until you find the emoji keyboard to turn on. Do the same thing for Android or search the Google Play store to see if there are any cool emoji keyboard apps that you can include. From there, head over to your bio and pull up your emoji keyboard and start including emojis or symbols to spice up the bio. Believe me, when you use a few different symbols or emoji it helps to spice up the bio and makes it more fun to read. You can also change the font that you use on your bio simply by typing up your bio on a different text editing software, from Microsoft Word, to Text Editor, to your Gmail account. Anywhere that will let you change the font of the text. From there, once you get it how you like it, just copy the text and paste it into your Instagram bio. This will keep your same font as before and spice up the profile to make it look a little more cool. As much as we all may love our Instagram feeds, and as many times as we may look in on them per day, there’s no way around the fact that a dozen other apps are constantly competing for our attention. As deep as we’ve swum out into the digital sea, it’s impossible not to become immersed in the vast swath of social media offerings that are constantly demanding us to download, update, post, share, Snap, reblog, and Tweet. It’s easy to get caught up in between all of them, constantly looking for a specific direction to turn in, a certain app to use, a way to tailor content that you’re posting and sharing in each that’s suitable to your style. The answer that we’re here to bring you, in 2018: follow the professionals. Social media isn’t just for individuals, and it hasn’t been for more than a decade. Ever since it was conceived and adopted by the public, businesses large and small have been generating the trends that control the shape and flow of social media growth, just as much as everyday users have. In 2016, with multiple social media profiles to manage all of the time, those trendsetters are using cross-promotion (not cross-posting; there’s a difference) to keep up with all of the necessary feeds. Cross-posting is simply copying and pasting the same information, the same images, the same links, the same everything in between your various social media feeds, including Instagram. Cross-promotion, on the other hand, is using the same content and information across multiple social media outlets, but tailoring its presentation to be appropriate to each one. It’ll require a little bit of legwork, but you can apply this rule to help balance your own Instagram-fueled lifestyle. Have a crazy-good Instagram bio, after following our above guide? Help your friends and followers to be more familiar with you by using the same information from the bio when you create more on Twitter, Facebook, Snapchat, and other social media platforms. The same goes for your content! Have a photo that you want to share across the internet? Don’t just point everyone to your Instagram account! Share it there first, of course, but take that same photo (or any type of post), and tailor it up to be shared wherever you’d like to present it. As a rule: the less that you have to drag friends and familiar faces from app to app and page to page, the better time they’re going to have following you! That wraps up this guide and hopefully gave you a pretty good sense of all the Instagram bio tricks that are out there. We hope you came out with some great ideas to make your bio that much better. As always, please share on Facebook or Twitter so your friends can use the same tips. Also, if you know of any good tips that we didn’t cover, please share them below in the comments! Note: This article was originally published on July 13th, 2015. It’s been updated as of May 8th, 2016, with new information to help bring your Instagram bio to life! See the end of the article for new details.